If you live in Austin, you can buy Pecan Chewies at the Central Market for about $5.00 a pack, but the homemade version is lighter and crisper. Plus, you can use whatever brand cocoa powder you want. For this batch, I used Scharffen Berger natural unsweetened cocoa and Texas pecans. Update: These are easy, but you do have to work quickly when spooning them onto the baking sheet so that the batter won’t run too much. If you’re a novice baker or are just new to this type of flourless cookie, you may want to make a quick half batch first. 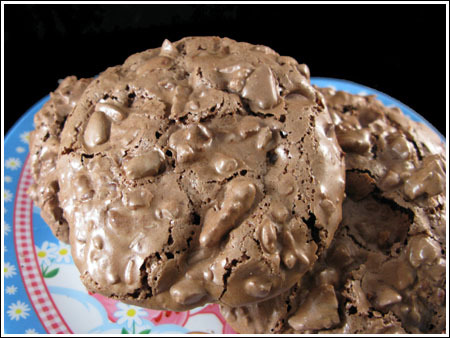 Chocolate cookies made with egg whites and pecans. Preheat oven to 400 degrees F. Line two large baking sheet with parchment paper or nonstick foil. Place egg whites in very clean metal or glass mixing bowl. Add the sugar mixture and stir with a rubber scraper, scraping sides of bowl, until ingredients are well mixed and batter is smooth and thick. With a handheld electric mixer, beat for exactly two minutes. Mixture will thicken slightly, but it will not be light and fluffy like meringue. Stir in pecans. Working quickly, drop the batter onto the baking sheets by rounded tablespoons, spacing about 2 1/2 inches apart. Bake the cookies on the center and lower rack for 10-12 minutes or until dry, puffed and cracked on the surface. Let the cookies cool for about 5 minutes on the parchment paper. Carefully remove cookies and let cool completely on a wire rack. To toast the pecans, spread on a baking sheet and bake at 350 for about 6 to 8 minutes or toast in a dry skillet. These look a lot like my favorite cookie at a local bakery, but their’s are espresso flavored and don’t have nuts. I think I’ll use your recipe as an experimental base. Thanks! This sounds exactly what I would have liked to bake today. Chocolate and pecans ! Mmmmmmm!!! Unfortunately I don’t have any pecans. 🙁 Somehow I ended up with three bags of english walnuts. Nuts were on sale so I picked up what I thought was a bag of walnuts and a bag of pecans, but when I went to get out the pecans I discovered both of the new bags were walnuts. No one here loves walnuts so it’s going to be a chore to get rid of these. I think some are destined for the freezer. It’s turning into a non-baking day here. Happy New Year everyone! Katrina, yes. I consider them health food. Lol. They are seriously good. Let me know if you try them. Yummy! And pretty much low-fat, besides the good fats–dark chocolate and nuts!